BUT THEY JUST ANNOUNCED TWO ALREADY~! Oh my, as soon as they announce Nanoha and Illya, out comes Nia and Yoko! For those that don’t know, most of the Dollfie Dreams that Volks releases are derived from eroge, such as the recently announced Illya and Nanoha. However Volks have seemed to have a deal with Gainax as well; re-releasing Rei and bringing Asuka to the Dollfie world. Now Yoko will be coming out fitted with the new Volks line of bodies, the Dollfie Dream Dynamite, which Ikkitousen has already put to use. Nia will be coming out in a standard Dollfie Dream II body, prolly with a S or M sized bust hehe. I’m very curious to see how Nia will look… I’d imagine it’d be quite a pain to get her hair to look right, especially with the colours. Yoko seems to be more feasible, and I wonder if the Sniper Rifle will be available too. For those who don’t like the photoshop look, the original one can be downloaded here. 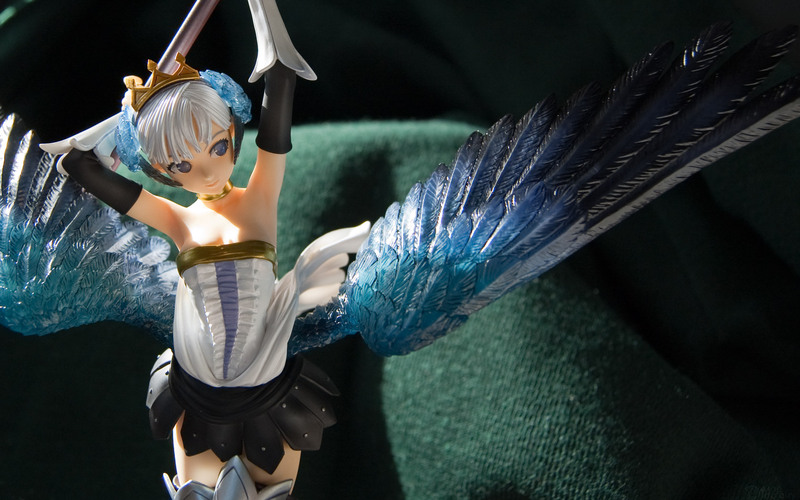 None other than Gwendolyn from Odin Sphere is featured, awesome game for those who haven’t gotten around to playing it. 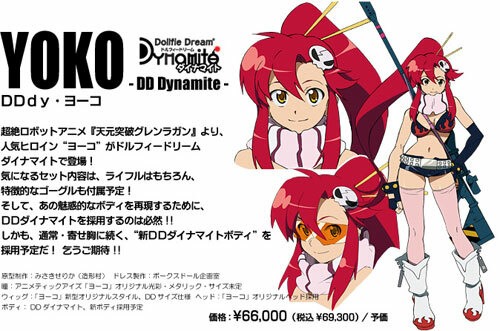 wah, i want to see yoko prototype! ron~s last blog (http://www.otadesho.com) post – PS3 Home IM@S Haruka Costume GOT! hey aya… if yayoi dollfie comes out.. will you? HAHAHA! I don’t think they can do Yoko justice. Her body is too dynamic. 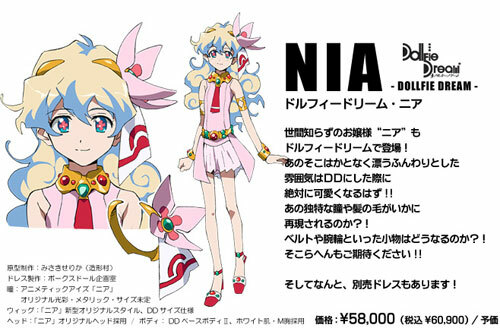 It’d be cool to see how they do Nia’s flower eyes. Price is unknown at this point, but it might be somethign worth looking into, I think Dollfies are 1/3 scale? I can’t imagine the size of Yoko’s rifle on a Dollfie scale. It’s not actually too hard, IMHO. Yoiko’s rifle is rather simple for a sniper rifle, almost like the AMAC Iver-Johnson rifle (though not the same, as we’ve seen). There’s a throwaway line in April 09 Dengeki about a 1/6 version of Yoko’s rifle somewhere, but it looks like it’s not the ‘full’ rifle–more like the trigger/firing mechanism, but lacking the long barrel. I’d guess a 1/3 version of Yoko’s rifle may be the same–in order to simplify it. A full-size version of the rifle might be 0.75 meter tall? Koshikos last blog ([site]) post – Where on earth is Koshiko!? @Kirakun, lol, A kamina dollfie would be pretty …scary? I dunno lol. If they make a Yayoi one….I’d prolly be poorer ._. @Hangmen, There’s pictures on the Volks DD Blog site, it actually looks pretty nice.